Biography of German Gothic Religious Painter: Isenheim Altarpiece. A treasure of German Gothic Art. Among the Greatest Paintings Ever. For a guide, see: What is Art? The German Northern Renaissance religious painter, Matthias Gothardt Neithardt (or Nithardt) has been known as Grunewald ever since that name was given him in error by the 17th-century historian, Joachim von Sandrart (Academia Artis Pictoriae, 1683). His name appears in the rate books of the Town of Seligenstadt, near Wurzburg, from 1501 to 1525. Noted for his intensely expressive Christian art, he became court painter in the early 16th century, first to Uriel van Gemmingen, then Albrecht of Brandenburg, successive Archbishops of Mainz; and he seems also to have advised on architectural and engineering schemes in the diocese. Married in 1519, Grunewald lost his place at court around 1526 because of his sympathy with the Peasants Revolt of 1525. He spent the last two years of his life in Frankfurt and Halle, cities sympathetic to the newly emerging Protestant cause. In Halle, he was in charge of the municipal waterworks prior to his death there in 1528. Along with the two other Northern Renaissance artists namely Lucas Cranach the Elder (1472-1553) and Albrecht Durer (1471-1528) he is commemorated as a quasi-saint by the Lutheran Church on April 6. Since much of Grunewald's work has been lost and there is a monogram signature on only three of his surviving paintings, chronology is problematical. His modern reputation has rested on one stunning work of religious art, the Isenheim Altarpiece, still in its complete state. There are also several smaller works, fragments of altarpiece art, and about 40 drawings. Although so few of his religious paintings have survived, and despite the fact that up until the late 19th century most (including the Isenheim Altarpiece) were incorrectly attributed to Durer, he emerges nevertheless as one of the most remarkable Old Masters of his age, indeed of all time. The small Mocking of Christ (1503; Alte Pinakothek, Munich), is probably his earliest surviving work and its features are characteristic of much that is to come. The religious drama is played out against a dark background, and the figures are highly expressive to accentuate the torment of the scene. There is a highly individualistic use of colour, which suggests an artist whose concern for painterly effects allows the brush to draw and describe in place of detailed preliminary preparation. NOTE: Late 15th century painting on the lower Rhine in North Germany was exemplified by the work of the Cologne School, which reached a highpoint under Stefan Lochner (c.1410-51) during the middle of the century. This work, entrusted to Grünewald in 1515, was the largest and most important commission of his career. It was painted for the High Altar of the Antonite monastery at Isenheim, Alsace (the altarpiece, dismembered for display purposes, is now in the Musée d'Unterlinden, Colmar, Alsace). Grunewald worked at the behest of Guido Guersi, the preceptor of the Order, whose coat of arms appears on the altarpiece. The Grunewald paintings were commissioned for the enlargement of a wooden altarpiece of 1505 containing figures of St Anthony, St Augustine, and St Jerome carved in about 1505 by Nikolas von Haguenau of Strasbourg. The paintings turned the work into a polyptych in three stages. By means of three pairs of wings, two movable and one fixed, the altarpiece could be opened and reopened to show different sets of religious representations for Weekday, Sunday, and Holy Day services. Its total surface area measures 2.65 metres (height) by more than 5 metres (width). The first stage shows the Crucifixion, flanked by fixed wings of St Anthony and St Sebastian, with a Lamentation on the prededella below. 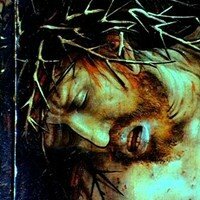 The Christ of the Crucifixion dominates the scene, his body racked with pain, the flesh torn and turning green. His figure is larger than those of his mourners, fulfilling the prophecy of the pointing St John at the right as inscribed on the picture: "He will increase whilst I decrease". The dark setting throws the figures into relief and heightens the emotion of the scene. Pentimenti, or changes in brushwork, revealed by X rays, show how Grunewald accentuated the expressive content as he painted; the fingers of the Magdalene have been lengthened and the Virgin originally stood upright. The second stage shows angels making music before the Virgin and Child and is perhaps best described symbolically as The Incarnation of Christ and the Glorification of the Mother of God. The angels show the artist at his most inventive colouristically, as they materialize before our eyes in pinks and yellows, sharp blues and greens. This visionary quality is matched by the building in which they appear, which seems itself to be in a state of metamorphosis with leaves and tendrils springing from the columns. This scene is flanked by the Annunciation and the Resurrection of Christ. In the latter scene the halo of Christ is the only source of light. The unearthly quality of this celestial light is especially evident in the trailing drapery where shades of white and blue turn to deep pinks and greys in the folds. The third stage of the altarpiece consists of the original carved structure with Grunewald's painted wings of The Hermit Saints Anthony and Paul in the Desert to the left and The Temptation of St Anthony to the right. Here are the most overt references to the duties of the Antonite Order in caring for the sick, by the presence of the medicinal plants in the Hermit Saints and the diseased figure in the Temptation. The chief iconographical source for the altarpiece as a whole has been identified as the mystical Revelations of St Bridget of Sweden, written in the 14th century and first published in Germany in 1492. See also: German Medieval Art (800-1250). 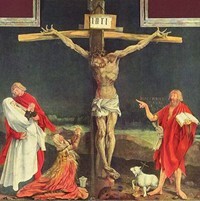 Grunewald painted three smaller versions of the Crucifixion (Offentlich Kunstsammlung, Basel; National Gallery of Art, Washington, DC; and Staatliche Kunsthalle Karlsruhe). Fragments remain of two other major altarpiece commissions. The Madonna in the Garden (now in the parish church, Stuppach) and The Miracle of the Snows (Augustinermuseum, Freiburg) probably each formed a part of the altarpiece in the collegiate church at Aschaffenburg (1517-19). Grisaille panels of saints (Furstenberg Collection, Donaueschingen, and Stadelsches Kunstinstitut, Frankfurt am Main) are from the Heller Altarpiece at Frankfurt. Some of Grunewald's drawings can be connected with lost works, including three paintings for the cathedral at Mainz. Many of his drawings are taken from the life and are highly unusual for their period. He used black chalk, often with a watercolour wash, to obtain softened, painterly effects. He is interested in the palpability of forms rather than line and contour; studies for the arms of the St Sebastian of the Isenheim Altarpiece are concerned less with the construction of the human form than with light playing over the surface of the flesh. See also the Danube School of landscape painting, whose works were influenced by the expressionist figures of Grunewald. Grunewald was almost the exact contemporary of Albrecht Durer (1471-1528), against whom all German art of the period is inevitably judged. And although Grunewald's works remained highly prized after his death, by the 17th century the artist himself was almost forgotten. Many of his pictures were attributed wrongly to Durer, and as a result, by 1850, German art historians regarded him as no more than a competent imitator of his more celebrated contemporary. However, the artistic revolt against rationalism and naturalism of the late 19th-century/early 20th-century, exemplified by German Expressionism, triggered a precise scholarly reappraisal of the artist's career. The current consensus is that by comparison with Durer - who remained primarily a graphic artist - the work of Grunewald, who ignored Renaissance classicism to continue the expressive and intense style of late medieval Central European art into the 16th century, reveals an inspired quality of painterliness that Durer was never able to equal. Due to their rarity, works by Matthias Grunewald can be seen in very few of the world's best art museums.  For a chronological list of dates, see: Timeline: History of Art.